Join the ranks of The Circle and clear Gallows Rock of werewolf hunters. Meet with Skjor at night. Participate in the blood ritual. Talk to Aela the Huntress. After completing a radiant quest, most members will point you towards Skjor for your next assignment; apparently he has something 'special' planned for you. Skjor turns out to be less talkative than usual and will request a meeting after dark near the Underforge, a secret crypt underneath the smithy of Eorlund Gray-Mane. At night, Skjor will wait for you near the secret entrance, determined to make you a stronger member of the Companions. He will then open the secret entrance and encourage you to follow. Inside the Underforge, you will encounter Aela the Huntress in her lycanthropic form, standing next to an empty fountain. Skjor will introduce her as your 'forebear', and will inform you that this is to be kept secret from Harbinger Kodlak Whitemane, and will then ask if you are prepared. When you are ready, Skjor will cut open Aela's wrist, filling the fountain with her blood. Activate the fountain and receive the Beast Form power, which causes you to black out. You wake up outside the Underforge, now as a werewolf, where you will find all of Whiterun's residents are now hostile to you. If you head into the streets, citizens will flee and guards will attack you, leaving you no choice but to avoid them or kill them. Due to your beastly appearance, you will not gain a bounty for assaulting anyone. After a certain amount of time, you will black out once again. The easiest way to avoid unwanted casualties is to simply wait a while after exiting the Underforge, as this causes your werewolf bloodlust to wear off, and the next scene to continue. Another option is to go back into the Underforge as soon as you've transformed, and use the secret exit that leads you out of the city. You can also simply avoid any attackers if you do not wish to kill any people in the city, you'll black out regardless of whether you killed anyone or not. This time, you wake up in the middle of nowhere, with a concerned Aela looking over you. Your gear has been unequipped, but you haven't lost anything; simply re-equip to prepare for battle. Aela will congratulate you on surviving the initiation and inform you that the Silver Hand, a group of werewolf hunters, have inhabited Gallows Rock and will not hide the fact that they should be slaughtered right away. She also informs you that Skjor already entered the fort. From this point, Aela will act as your follower, dismissing your current follower if you have one. Head west towards the fort. A number of Silver Hand members will guard the exterior area, so dispose of them and enter the fort. "The bastards... somehow they managed to kill Skjor." The first room is a sealed-off area, so pull the chain next to the severed werewolf head and proceed forward. The fort is buzzing with enemies and werewolves in cages, both living and dead, all seemingly exposed to torture by their captors. Be on the lookout for the One-handed skill book The Importance of Where in the huge southern chamber, the Smithing skill book The Last Scabbard of Akrash near the workbench, as well as several locked and unlocked chests. 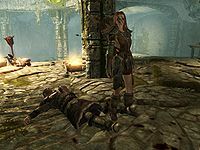 Aela will comment on the first dead werewolf you find, which is found next to a set of rare Torture Tools. If you sleep before meeting with Skjor and Aela, you will retain the effects of being Rested, Well Rested or Lover's Comfort until time expires. Your beast's blood will prevent you from getting them again unless you cure your lycanthropy after the Companions questline is completed, so do not sleep in any of the many beds in the Silver Hand base. 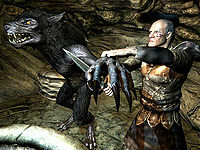 If you have Dawnguard installed, this is your first opportunity to start acquiring werewolf perks. If you're in Whiterun, you can kill and feed on guards and citizens for werewolf experience. Guards killed will respawn eventually, but citizens will stay dead. Unless you have the Ring of Hircine, transforming is not immediately possible during the Gallows Rock section. This is because Beast Blood is considered a greater power, thus there is a one day cooldown before you can transform again. Simply waiting 24 hours will refresh this and allow you to use your new gift to fight the Silver Hand. At the end of running around on your rampage through Whiterun, the screen will fade and load the next sequence in the quest. After it finishes loading, the game automatically closes for no reason. Simply restarting the game and trying again should fix this. Sometimes, you can transform again after the Rampage stage, but before the Gallows Rock stage, enabling you to fight the Silver Hand in Beast Form and ignoring the 24 hour cooldown. Sometimes, you won't go on the rampage through Whiterun and instead skip straight to the part where you are with Aela, although the 24-hour cooldown period is active. ? 10 Skjor and Aela say they have some sort of special assignment for me. I'm supposed to meet them underneath the Skyforge tonight. 25 I have ascended to the Circle which leads the Companions, and now share their blood as a werewolf. To celebrate my new status, Skjor and Aela have invited me to attack a Silver Hand camp nearby. 200 Finishes quest I have ascended to the Circle which leads the Companions, and now share their blood as a werewolf. Aela led me to a Silver Hand stronghold where Skjor fell in battle. She has enlisted me on her quest for revenge. On the PC, it is possible to use the console to advance through the quest by entering setstage C03 stage, where stage is the number of the stage you wish to complete. It is not possible to un-complete (i.e. go back) quest stages, but it is possible to clear all stages of the quest using resetquest C03.